It all started when he and his wife first discovered the sanctuary, Elephants World, online, Barton explains in a video. "We liked the sound of the place being a retirement center for old, injured and handicapped former logging and trekking elephants," Barton said. "So we paid them a visit. I wondered if these old rescue elephants might like to listen to some slow classical music." "[He] was often in pain, and I like to think maybe the soothing the music gave him some comfort in the darkness," Barton said in the video. The musician said this was the first elephant to really take to his music. Sadly, the gentle giant died of an infection, Barton said. "I was heartbroken when he died," he said. The musician's videos have gained widespread attention. One elephant in particular, Lam Duan, received 20,000 views. 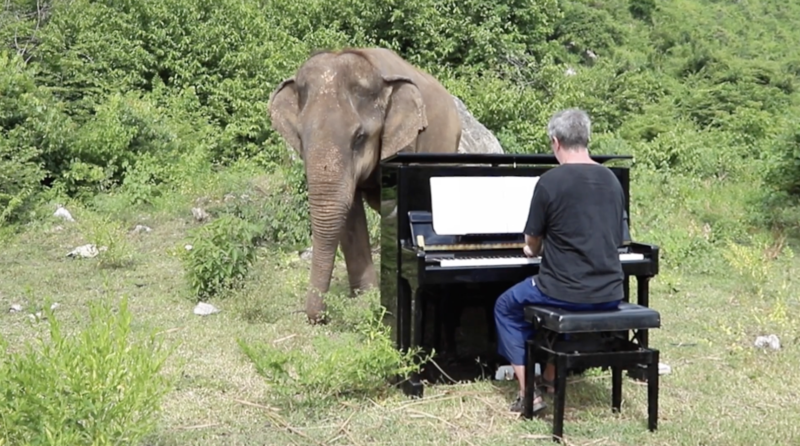 Barton usually describes the composer and piece of music he's playing as well as the elephant he's playing for. "Clair de Lune by Debussy on piano for a gentle female elephant called Ampan. Ampan is 80 years old," Barton wrote for one video. "Bach on Piano for Blind Elephant," he titled Lam Duan's video. Despite the fact that some animals in his audience are old and can't see, they don't need to. When Barton comes to play his soothing piano, they can take part in the beauty of the world again.